- how to pack fur pack? Does anybody have instruktion? - number on pickelhaube cover should be 1 (1. pommern) or 2 (2 gren. reg.). I supose it should be red. Was that number painted or sewed? - what kind of bayonnet grenadiers used? That with saw ("butcher") or without? - I found in Internet parts of german drill book. There is only a drill with rifle. Have any body drill book with drill without weapon? Sorry if my questions look like questions of child. Also sorry for my english. There's some info on this site altearme.de I think... that, or there's altearmee.org (different sites) also, might be on this site, Verein Historische Uniformen e.V..
Red, "1" and either sewn on wool numbers or painted too... both were done. The one called "Quillback" or "feather" bayonet. The "Butcher was not used until a bit later. Pretty much the same as WWII or Armies the world over... except the about face command is done to the left. Regular was a red sewn number. Stenciled painted numbers was regular carried of Reserve-Infanterieregimenter. On august,15.,1914 the Prussian War Ministry give order to use green numbers. For the model 1915 Spike Helmet with removable spike came (july,28.,1915) a new green cover, most with painted green numbers. But: In fact the troops remove the remarkable numbers often in the field! On October,27.,1916 come official order to remove all numbers. how to pack fur pack? This was replaced starting from 1915 by the SG98/05, since it was too long for the trench combat and often broke off! Bayonets with the saw back mainly by pioneer-troops were used! By the Infanterie only every 10th man carry a saw-bayonet as a tool. This were often NCOs. I red that 1 Pommernishe Grenadier Regiment, by decision of Kaiser Wilhelm II from 1909 or 1910, could use garde badges on uniform (white straps) on neck and hands (parts of uniform - don't know how to name it in english). I've got pictures of this unit where it is. But I don't know what was the pickelhauben eagels and thing that made to not pichelhaben get off from head (belt?). I serached in internet but only pictures of pickelhaube i found of garde grenadiers is NCO (NCO - what does it mean?) - where it was gold. How was it in private grenadier? Sorry if my questions are easy - here, in Poland that topic in literature is very, very poor. Also soory for my english. I hope Youunderstand it. A NCO is in german a "Unteroffizier". NCO-ranks are: Unteroffizier, Sergeant, Vizefeldwebel, Feldwebel. For the chinstrap/"Kinnriemen" or "Sturmriemen" ("...thing that made to not pichelhaben get off from head (belt?"...) i must look, but i think it is the guard chinstrap. Is this pickelhaube good for grendier? Of course need to change eagle, but what else? Where can I get reproduction or replica of garde grenadier eagle on pickelhaube? 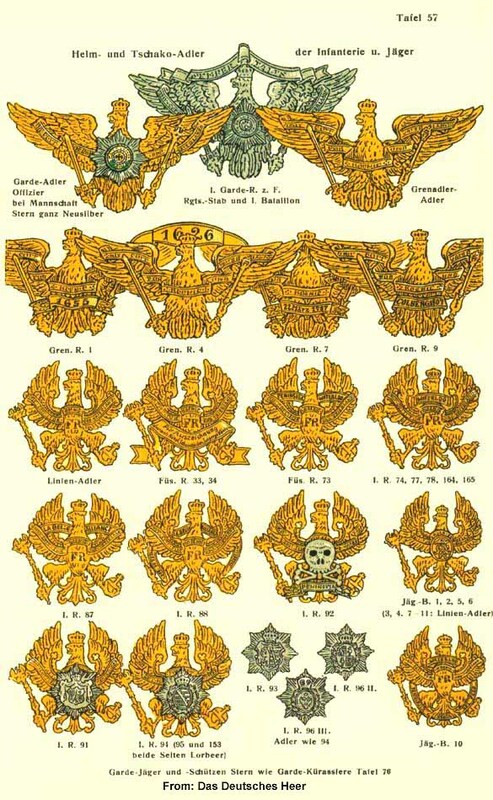 Since 1842 the crest insisted of a yellow coat of arms eagle with swung signature mark FWR and oval Medaillon, starting from 4.5.1897 infantry eagles with spread wings and Akanthus on sceptres. The shed chain, the point and the plate split pins were yellow. To 29.6.1860 the hair shrubs were lent. For all battalions black shrubs and yellow funnels. Since that 4.5.1897 truen it also white chapel braids. The shoulder straps were white and since that 3.12.1840 with red signature mark king Friedrich Wilhelm IV and since that 8.1.1861 the No., thus FWR IV.